Forget the future. The world already is nearly five times as dangerous and disaster prone as it was in the 1970s, because of the increasing risks brought by climate change, according to a new report from the World Meteorological Organisation. The bottom line: natural disasters are occurring nearly five times as often as they were in the 1970s. But some disasters – such as floods and storms – pose a bigger threat than others. 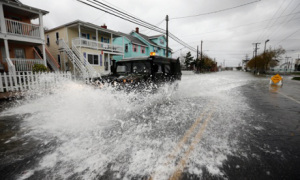 Flooding and storms are also taking a bigger bite out of the economy. But heat waves are an emerging killer.